LGBTQ people have always found a way to take nominally straight public places and make them their own. Sometimes these were only corners of hotel bars, certain street corners or sections of parks, but often they were coffee places or sandwich shops. From World War II until the 1980s, the Philadelphia area was home to many of these “old line, crockery, silver and glass restaurants.” There were 24 Linton’s, 44 Horn and Hardart’s and 18 Dewey’s. 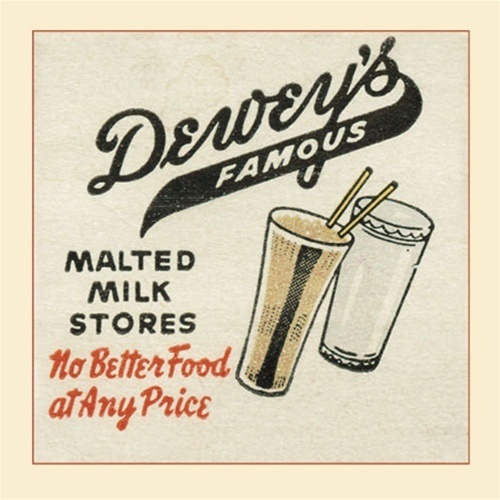 The Dewey’s chain began in 1940 in Philadelphia and within a few years there were Dewey’s sprinkled along Market, Arch and Walnut Streets and around Rittenhouse Square. Some had tables, but most of them were simple lunch counters, serving hamburgers, hot dogs and malteds, see photo, below, from 1941. Of course, lesbians, gay men and trans people frequented all of these places, but two locations of Dewey’s have a special connection to the Gayborhood and to the history of gay activism in Philadelphia: the Dewey’s on 13th Street and the one on 17th in Rittenhouse. This Dewey’s was near to the bars on 13th, Camac and Chancellor Streets and it was open all night. It was the perfect hangout after the bars and the after hours clubs closed. Widely known as the “fag” Dewey’s, it was noisily packed late into the night with a whole spectrum of drag queens, hustlers, dykes, leather men and Philly cops looking for a cup of coffee, a cross section of life on 13th Street. The problem was that other managers of Dewey’s around the city were intent on keeping the queer tolerant 13th Street Dewey’s the exception and not the rule. 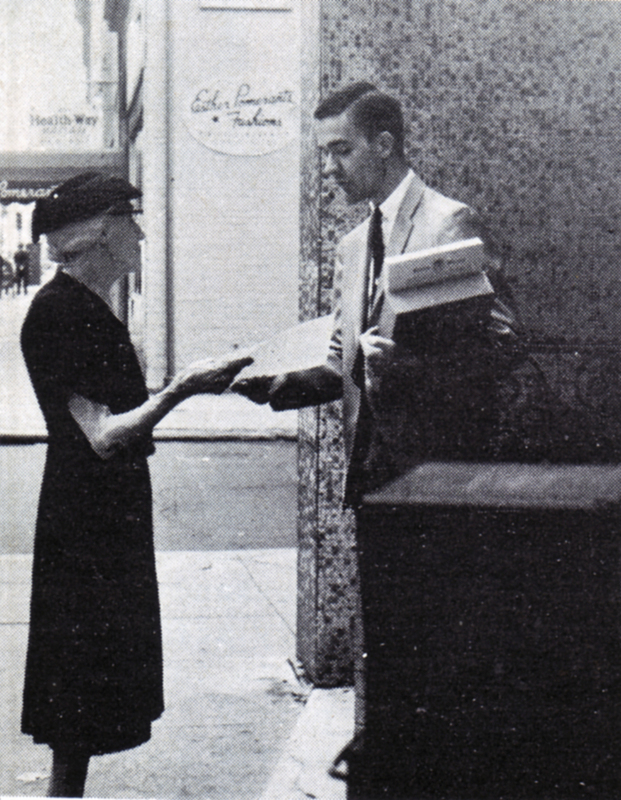 In 1965, the management of the Dewey’s at 219 S 17th Street near Rittenhouse Square (now Little Pete’s) made it clear that they would refuse service “to a large number of homosexuals and persons wearing non-conformist clothing.” Modelled on current African-American civil rights protests, on Sunday, April 25th, more than 150 protestors, black, white, trans, lesbian and gay staged a sit-in, an amazing thing to do in Philadelphia in 1965, four years before the Stonewall riots. Police arrived and three of the protestors who refused to leave were arrested. They were young; two males and a female. Journalist and activist Clark Polak and the Janus Society, a local gay rights group, were notified. Over the next week, in support of the protestors, they distributed some 1,500 leaflets outside the restaurant, see photo, above, right. On Sunday, May 2, they staged a second sit-in. 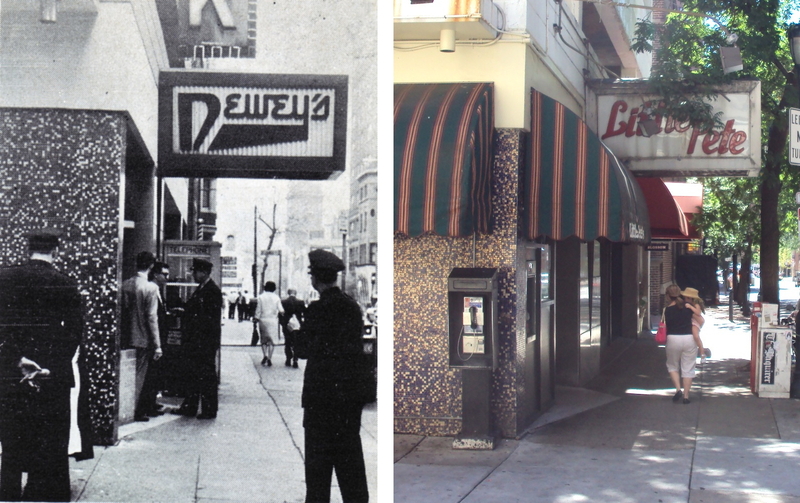 This time, when the police were called, they spoke with the protestors and simply left, declining to take any action at all, see photo, below, of the police at Dewey’s in 1965 and the same location in 2010. The management agreed to end the discrimination and the protestors left, having staged the first successful gay rights sit-in in the country. This marked an important step in the struggle for LGBT people to lay claim to the right to public space in 1960s Philadelphia. 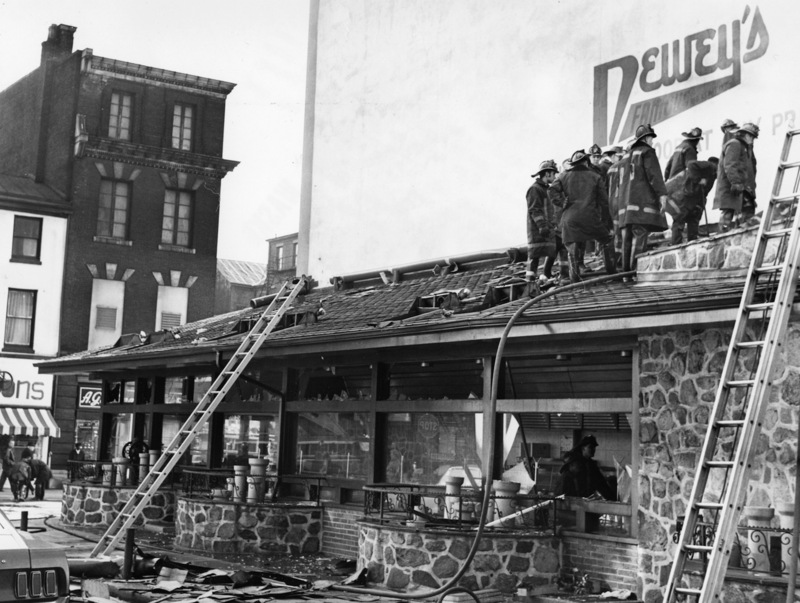 In the late 1970s, the Dewey’s restaurants in Philadelphia began to fold, victims to competition from national fast food chains like MacDonald’s and Burger King. In 1979, the 13th Street location came under gay operation when Lester Ketters opened a restaurant there under the name The Ranch. In 1981, Les and his partner Larry changed the name twice, once to The New Pirate Ship, left, in honor of an old, long gone gay bar called the Pirate Ship on Camac near Locust Street, then to The Captain’s Quarters. He then sold it in 1982 and it became The Pyramids, a Near-Eastern restaurant with Egyptian owners. 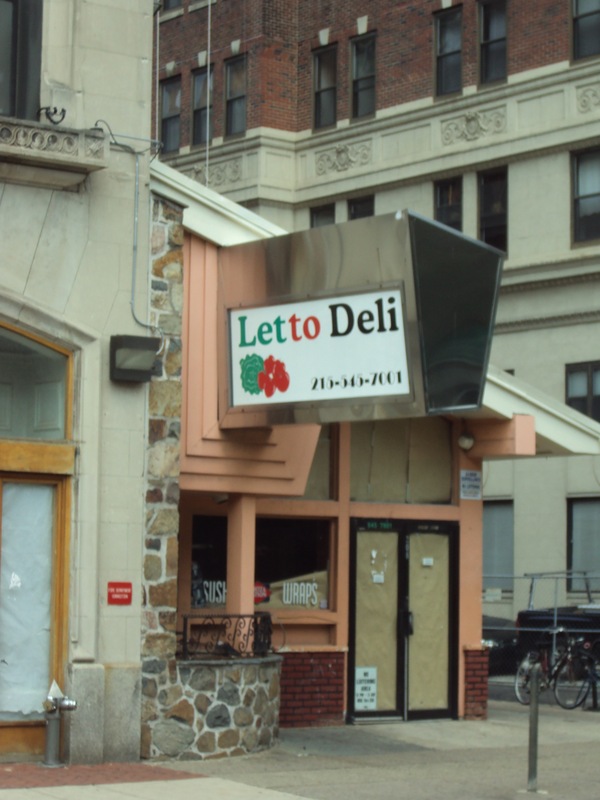 It’s last incarnation was as the Letto Deli, which closed in early 2009 after the rent was hiked, see photo below, right. In 2010, Iron Chef Jose Garces planned to open a German restaurant called Frohman’s Wursthaus at 208 S 13th Street. Because of his reputation, in early 2012, after two years of planning, it looked like there would be very little, if any, opposition from the Washington West Civic Association zoning committee. However, just a few months later, Garces announced that he had too many other projects up his culinary sleeve, and the Wursthaus concept was shelved. The 53 year old structure is still forlornly vacant today. 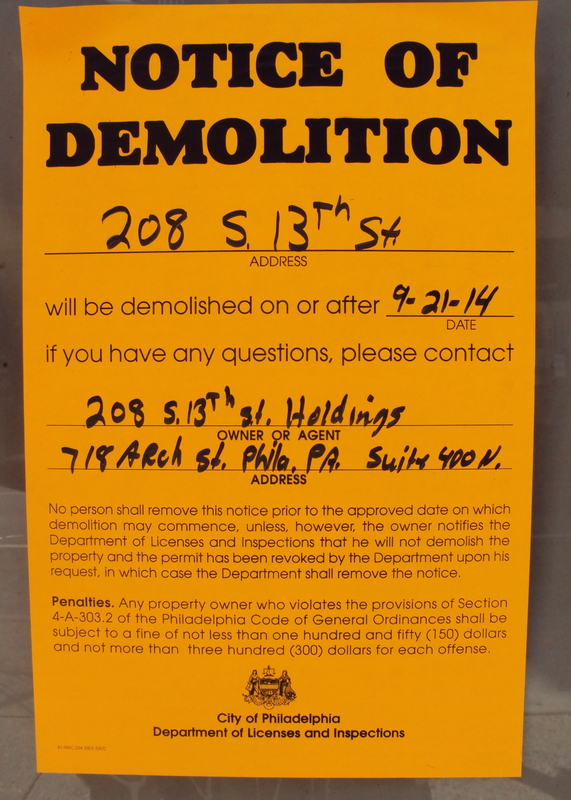 For a few weeks now there’s been a demolition notice, below, on the front door. It looks like tiny building will be no more soon. 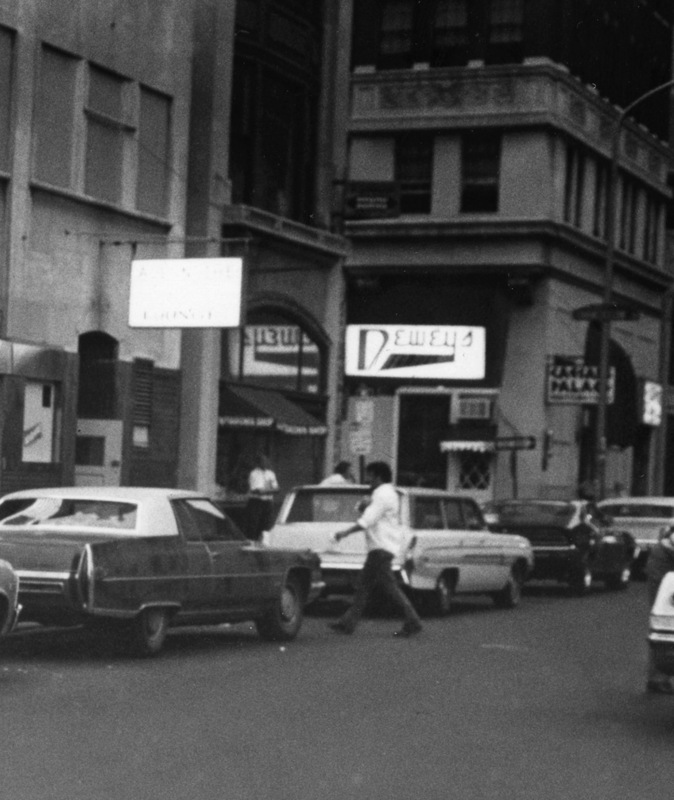 Seems to me there was a Dewey’s around 15th & Locust or was it Spruce as well? I have been a denizen of the 17th St Dewey’s since 1965… It’s definitely the “up all night” effect that brought in the LGBT clientele. Tes, Dewey’s was all over Center City. In 1973 there were 11 listed in the phone book: 17th & Market, 15th & Arch, 206 N Broad, 326 N Broad, 20th & Chestnut, 1031 Market, 49 N 11th, 1301 Market, Broad & Sansom, 13th & Chancellor and 17th & Chancellor. Definitely was on the southeast corner of 15yh & Locust, later became a bank branch and then Cosi. 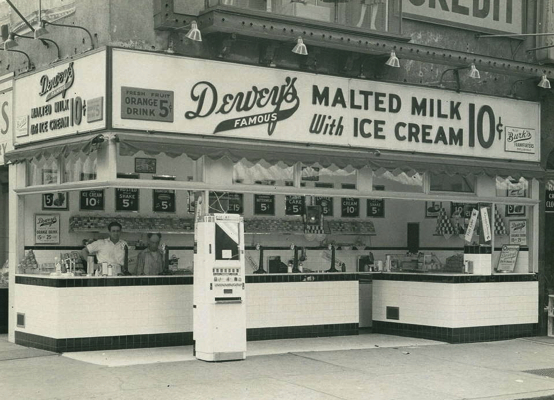 There used to be an open – air Dewey’s just as the one pictured at the southeast corner of Seventeenth and Market Streets . The one pictured was on 8th and Market, but right you are, I do have a photo of the one on 17th and Market. I remember a Dewey’s restraunt at 48 th and spruce street during the late 1950 s. It was a hangout for young teenagers. Does anyone recall this place? was deweys 13 street removed? It was just torn down very recently. I miss Dewey’s, I worked at Hahnemann Hospital and that was the hangout at lunchtime. Dewey’s burgers were so good. Hi Peggy, My dad had a Parking lot at Broad and Race Sts. As a young man I would go to Dewey’s for his coffee and our lunch. My dad was friends with the owners and employees. Some of the guys even worked for him PT. Anyway you are right about the Bergers they were the best. And White tower was right across the St. Also Hahnemann was my dads first ever Bypass back in the early or mid 60’s..I grew up at Broad and Race sts. I’m 73, and every once in a while Dewey’s comes to mind. I worked in the PSFS building on 12th Street off market. There was a Dewey’s on market. I loved their hot dogs, but more important I loved their mustard. A yellow mustard dotted with cayenne pepper. Just the right amount. When I was pregnant in 1967 with my son, I remember having a craving for a Dewey’s hot dog in the middle of the night. My sweet husband Frank drove me to Philadelphia from South Jersey, just to have a hot dog. As we ate our hotdogs I explained to the guy working that it was really the mustard. The hotdog was really only the vehicle for the mustard. Guess what, he made sure the squeeze bottle was full, and gave a very pregnant woman mustard to take back to Jersey. I’ve never forgotten that, and often share it with others. What a sweet 50+ memory. Thanks so much for sharing this memory, Lorraine! Great story, Lorraine. I remember loving their hot dogs and never figured out that it was mustard. Their orange drinks were also great. My Dad worked in the PSFS Building for 20 years and I basically grew up in that building. Remember Coffee Corner across the street? My first strawberry malted was there. Yum! And, speaking of Dewey’s, when I would go to boys’ choir rehearsal on Saturday mornings, we would stop at this 13th Street Dewey’s and there was always a wonderful warm waitress named Violet who would serve us. Do anyone know how the burgers were made. I loved Dewey’s, the best Hamburgers..